Xtracycle believes that “Transportation and community ride tandem across the globe.” And Xtracycle is the leader in creating long-tail, cargo-friendly, and kid-friendly bikes as an affordable alternative to automobile dependence. With <a href=”https://www.bikeshophub.com/product-category/xtracycle-extension-kits-c-230.html”>Xtracycle Extension Kits</a>, nearly any bike with 26-inch or 700c wheels can be a long-tail cargo bike for extra cargo carrying capacity. 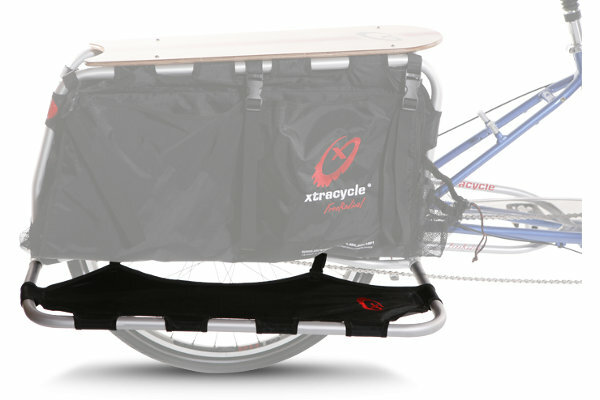 The <a href=”https://www.bikeshophub.com/product/xtracycle-freeradical-cargo-bike-kit-p-1419.html”>Xtracycle FreeRadical Cargo Bike Kit</a> comes with everything necessary for installation. Add a <a href=”https://www.bikeshophub.com/product/xtracycle-longloader-rack-p-1440.html”>LongLoader</a> to carry longer items such as a surf board. The <a href=”https://www.bikeshophub.com/product/xtracycle-wideloader-rack-p-1424.html”>WideLoader</a> or <a href=”https://www.bikeshophub.com/product/xtracycle-sidecar-p-3331.html”>SideCar</a> can carry wider items like small coolers. We think of Xtracycle as a hitchless cargo trailer that extends from your bicycle’s rear triangle — at least that’s how we rationalize listing in here on Bike Trailer Shop. We have <a href=”https://www.bikeshophub.com/product-category/xtracycle-child-accessories-c-271.html”>passenger accessories for adults and children</a>, such as <a href=”https://www.bikeshophub.com/product/xtracycle-footsies-p-1439.html”>Footsies</a>, a <a href=”https://www.bikeshophub.com/product/xtracycle-magiccarpet-cushion-p-1434.html”>seat cushion</a>, high quality <a href=”https://www.bikeshophub.com/product/yepp-maxi-easyfit-xtracycle-peapod-iii-bike-child-seat-p-2154.html”>child seats</a> like the <a href=”https://www.bikeshophub.com/product/yepp-maxi-easyfit-xtracycle-peapod-iii-bike-child-seat-p-2154.html”>Yepp Maxi Easyfit / Xtracycle Peapod III Bike Child Seat</a> these child seats allow you to bring the kiddo along for a ride they will enjoy with the soft seat that fits and comfy! Don’t forget the Helmets and get one that your kid will love! <a href=”https://www.bikeshophub.com/product-category/nutcase-child-helmets-c-1622.html”>Nutcase Child Helmets</a> will do just that! It’s safe and cool designs will ensure a smooth ride! Ready to go solo? Check out the <a href=”https://www.bikeshophub.com/product-category/strider-balance-bikes-c-367.html”>Strider Balance Bikes</a> or the <a href=”https://www.bikeshophub.com/product-category/cleary-bicycles-c-1617.html”>Cleary Bicycles</a> for adventures that they can start by riding their own bike around!